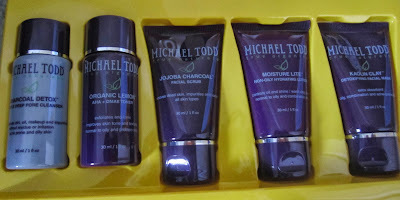 So here I am back on schedule with a review of one of the products I talked about in my Michael Todd true Organics haul! I haven’t properly tested out everything because I did have a bad break out and wanted to slowly transition into the products after that to see what caused it. All I know is that it definitely was not this one! I’m mainly going to be discussing the charcoal detox deep pore gel cleanser which is amazing. I use it every night and once or twice a week I’ll implement the charcoal scrub by MT in. I’m all about the charcoal face products right now and my skins loving these two. When I stopped using the toner and moisturizer (one of them was breaking me out and I can’t figure out which one it is) my skin cleared up and I have had some stress and hormonal breakouts but that’s normal for me. I know that this cleanser didn't break me out because if it was the reason for it I would have broken out right after my first use of this. and when I stopped with the toner/moisturizer duo I had very few spots come up. I have a feeling the toner broke me out because I tried to use it a few days ago as a way to experiment and the next day I had a new spot on my cheek which never happens. I will be testing out the moisturizer again after my birthday to see if that affected me as well. I definitely want to try to antibacterial algae toner from MT instead because I've heard great reviews even from people who suffer from cystic acne. Some people say they don’t like the smell of these products but I am obsessed with the scents of the charcoal ones. I love everything charcoal as I mentioned before: my origins charcoal mask and these two charcoal products smell like heaven to me (I know… I’m weird!). I highly recommend these two charcoal skincare products from Michael Todd if you have oily acne prone skin and even if you’re sensitive these will work and won’t be harsh on your skin. This is a picture from my Haul blog showing the products that came in my set! P.s the kaolin clay mask stings like a b**** but it actually works really well. It's awesome to use a spot treatment over night on any bad ones you may have. What are your thoughts on Michael Todd products? Tried any that have helped you immensely with acne?